One of the reasons I am here is the late Christopher Hitchens, a good friend with whom I worked and argued for twenty years. I disagreed with Christopher on practically everything - his belief in the innate corruption of Mother Teresa, for example, his enthusiasm for the Iraq invasion and for gun ownership in the United States. But on the return of the Parthenon Marbles to Athens, Christopher was right, and I want to take the opportunity to salute the work he did in pressing the case for restitution. To some extent my contribution today is in memory of his stimulating company and his ability to make us all think and argue better, however crazy some of his notions. In his book, The Parthenon Marbles, he was at his most forensic, passionate and brilliantly polemical. Anyway, I tracked down the accounts of these cleaning operations in the newspapers of the time and came across an interview with the man responsible, - one Arthur Holcombe, who was quoted in the Daily Express on May 1939, after the scandal erupted in the British press. What can I say? The only word is ‘sorry’. 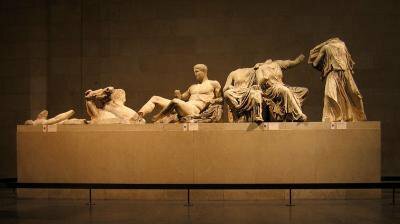 Britain has a lot to apologise for and it is time we made amends by returning the marbles to Greece to make the Parthenon as whole as is possible after 2,500 years. But the campaign is tough because it challenges an almost superstitious belief that the marbles are a British possession, just like the Rock of Gibraltar or maybe even the Falkland Islands – though, in truth, we have far better claims on those two dominions than the marbles. Last weekend, I went to see Marbles again. I often go, though increasingly I feel uncomfortable about it because the experience seems somehow illicit: in a way, it’s like coming across a beautiful Renaissance drawing in a friend’s apartment, which you know is stolen. The point is that true appreciation of a great work of art cannot be tainted by complicity in an illegal act. The notice has all the duplicitous ease of a PR man whose corporation has just polluted your water supply. But despite its many euphemisms and omissions, it is truly eloquent. The Museum authorities are reminding us that there are, in fact, no good arguments for retaining this stolen property. If there were, they would place them there for all to see. But greater than the offence of omission is the sly attempt to make a virtue of the separation. The Marbles are one coherent work, and, as we know, a high point in all civilisation that still draws gasps from a modern audience. The idea that they should serve different curatorial purposes in different locations is utterly false, but you can see why the BM authorities are presenting it this way. It’s a necessary evolution of the British defence to cope with the opening of the beautiful new Acropolis Museum in Athens. So, instead of acknowledging the case for wholeness, they make a virtue of the marbles’ place in the context of the Museum’s collection of antiquities. I cannot tell you how angry this makes me. It’s enough to say that a return of these sculptures would be a magnificent gesture to world culture and to the Greek people themselves. These works, commissioned and executed nearly 2,500 years ago, have meaning for all mankind, but they also lie at the core of Greek identity and self-esteem. While the Museum argues that the marbles perform a function in London that they cannot in Greece, because London is one of the truly International cities in the world, I’d like to remind the BM that there are millions of Greeks who will never be able to come to London to see them. And, besides, Athens can cater for a cosmopolitan audience just as well as London, as we all saw during the Athens Olympics. The continued presence of the marbles in London is not just an offence to wholeness, but it is a reminder of the feelings of powerlessness and injustice of occupation. These great works, containing the spirit of reason and the dazzling self-confidence and composure of the Athenian civilisation, are also evidence of national humiliation two centuries ago, when Greece was unable to defend the essence of its culture. It may be going too far to say that some part of Greece is still occupied by a foreign power, but that is the way I see it when I go to the Duveen Gallery. We are still - bewilderingly and illegitimately - in possession of a part of Greek territory. Lord Elgin’s theft was the most ignoble act of the neo-classical era. Today, his actions seem as redundant and repulsive as slavery and colonialism, and I am being quite serious when I say we should see the Marbles continued presence in London as vestiges of both, for had the Greeks not been enslaved to the Ottomans, they would surely never have allowed this vandalism and theft to take place. I won’t go on - it will be bad for all our blood pressure. But I will just say that there is a moral imperative to try to right the wrongs past, just as Her Majesty’s Government has done by apologising for illegal acts committed in Northern Ireland and Kenya. They feel a deep, instinctive possessiveness, even if they have no knowledge of the marbles, no grasp of the case for restitution and no understanding of the transparent sophistry used by the BM and British Government to retain them. It is truly a sense of colonialist entitlement that keeps them in London. People are not prepared to think too deeply about the issue because it affects our national amor propre, where reason is pretty much always absent. When pressed, they go to the default position of arguing that a return would lead to a flood of appeals from foreign countries for works of art. That is simply wrong. The Parthenon Marbles have an obviously unique status. But where other national treasures – and that is a very rare and special category – are shown to have been separated or are marooned in some foreign institution, I cannot see the problem in considering a return. It is simply a question of what is right. I cannot think of a more arrogant line. Would the British feel pride if the royal tombs of Westminster Abbey were lying in the Met, in New York, or half of Stonehenge had been transported to Athens or even Brussels? I very much doubt it. Certainly the first two of these, and probably the third, dictate a return of the Marbles to Athens, and Hunt surely knows that. His argument went down very badly with the audience, which had been broadly balanced on the issue at the beginning of the debate. At the start, 196 people were for sending them back, with 200 for retaining them and 158 don’t-knows. At the end, 384 people voted to send them back and those against had been reduced to 125, with just 24 don’t-knows. So, a majority of four in favour of keeping the marbles was reversed to a majority of 259 for sending them back. When the issue is properly aired and the arguments properly heard, the case for return has an overwhelming moral appeal in Britain and that is why I know that one day we will make amends and return the marbles in a gesture that I believe my country is fully capable of. I would add to “justice” the word liberty. For that is what the Greeks will celebrate when they see the return of the treasures that were taken from them during the occupation by a foreign power. It will be a symbolic and actual liberation.